Bengali TV Channels From DISH – $19.99/mo. Add your favorite Bengali channels with DISH’s Prabasi Pack! The best TV from Bangladesh and India is delivered straight to your home in high quality HD. Enjoy music, reality TV and children’s programming with shows like Bhajans, Dashi, Bollywood Bumper and Rannaghar all day with no buffering or interruptions. When you subscribe to Bengali TV from DISH Network, you can also watch great movies on bigflix.com. The best Bengali channels are included in DISH’s Prabasi Pack. Watch reality TV, music shows, kids’ favorites and more, all delivered straight to your family’s TV. Enjoy yoga with Aastha, or catch shows like SB Supaarhitz and Howrah Bridge on Sangeet Bangla. There are also live reports to keep you up to date on international news. Personalize your Bengali TV package with extra channels from around the world, including Willow Cricket HD, NDTV 24*7, France 24 and more. Enjoy more news, sports and global entertainment at a budget-friendly price with these add-on packs, designed with international families in mind. 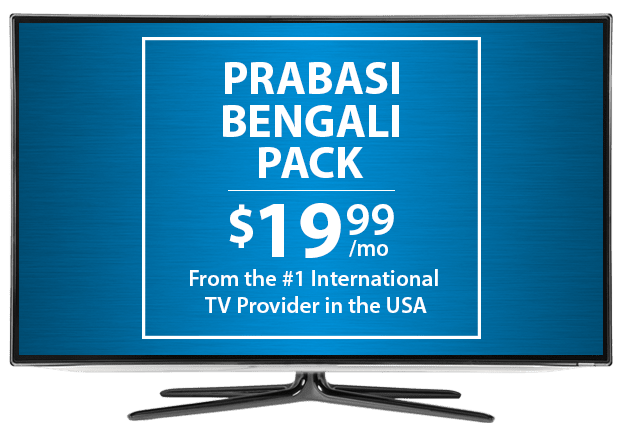 To start watching Bengali TV, subscribe to an American DISH TV package like the value-filled America’s Top 120, or the entertainment-filled America’s Top 250 package. You can also add the Prabasi Pack to the DISH International Basic or Chinese Basic package for a TV plan tailored to international viewers. Want more? Add on channel packs for world news, cricket and movies!